Renault are celebrating thirty years of F1 involvement (occasionally out but mostly in) since their first GP victory in the modern era. That was the French GP at Dijon in 1979, a race won by Jean Pierre Jabouille in the RS10 but more usually remembered for the terrific battle for second place between Gilles Villeneuve in the Ferrari 312T4 and Rene Arnoux in the other Renault. So famous is that wheel-bashing fight that it is often reported as being for the lead - poor Jabouille's win is so overshadowed by what was happening behind him. We get a few seconds of him crossing the finish line in the standard YouTube video of the race. That Renault's historic victory was outstaged in such a manner was somehow indicative of the company's future relationship with F1. After spearheading the turbo revolution in the late seventies and early eighties, the Renault team failed to secure a championship and often alienated the drivers who gave them their best shot at such an achievement. 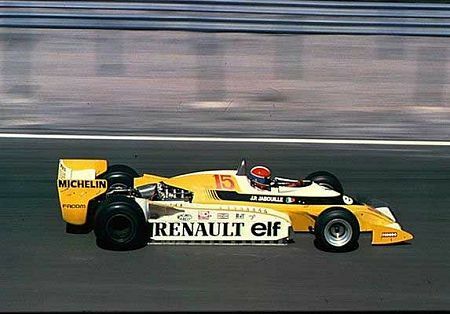 Jabouille, who had put in the hard work for years to make the turbo competitive and reliable, was dumped at the end of 1980 in favor of the rising French star, Alain Prost. Arnoux, too, found himself squeezed out after one season partnering Prost, the two Frenchmen proving a rather volatile combination. And then the team fell out with Prost after he was narrowly beaten to the 1983 championship by Nelson Piquet. The '84 and '85 cars were never really competitive and the company closed down its team after experiencing financial problems. It supplied engines during 1986 but then withdrew altogether until its return as an engine manufacturer in 1989. Those were the great years of the company, both Williams and Benetton winning championships when powered by Renault, but again the costs proved a bit too painful for the manufacturer - it withdrew at the end of 1997. Being Renault, however, it could not stay away and, in 2000, it bought the Benetton team to re-enter the game. With Flavio Briatore at the helm, the team proved rather better at driver management and won the 2005 and 2006 drivers and constructors championships. It is a tale of fluctuating fortunes and varying degrees of commitment from the board of directors - even today, no one really knows whether Renault will stay the course this time or drop out in the face of hard economic times. But the company can look back on some great innovations such as the introduction of turbo power in 1977 and the production of the first 3.5 liter V10 in 1989, both of which changed the face of F1. It is a pity that scope for engine development is so limited these days for it seems Renault's destiny to come up with new and unusual ideas in that area. Until 2012 when the engine rules change, it remains to be seen whether the team continues in the sport, especially now that its current mantra, Fernando Alonso, seems likely to be in a Ferrari next year. Rumor has suggested a Briatore buy-out of the team if Renault decide to withdraw but I would not count too much on that one; the Flav has said before that he would like to retire soon. So Renault assumes the mantle of team most likely to withdraw in the near future, Toyota having proved surprisingly tenacious in that regard. I, for one, would be sorry to see them leave. The team has been an important aspect of F1's appeal over the last few years, unpredictable as it is, and they lead the way in reaching out to an increasing fanbase through innovative web techniques. It must be the most fan-friendly team of all and that is not just through the entertainment value of Flavio's press releases and occasional outbursts! Here's hoping for another thirty years of Renault in F1. Talking about french teams, it's been a long since we last saw a french team in Formula 1 besides Renault. I can only remember Prost, Larrousse, AGS and great ones like Ligier and Matra. Odd enough for a country with strong manufacturers like Citroën and Pegeout. I think that it's not only financial problems that will make Renault bail out from Formula 1 - There seems to be little interest in its president to stay in the sport. If they ever happen to leave, will be a great loss. I don't mean that we will lose a competitive team, however - nowadays, Renault has a historical appeal, along with the recent memories of 2005 and 2006. But since 2007, performances only goes from bad to worse. Pity though. Renault were champions in 2005 and 2006 I believe,. The French love to innovate and have a deep seated love for freedom. Over the years I have worked on Renaults, Citroëns and Peugeots. Sadly, since the local government(s) took away too much of these companies freedom, they quit selling their cars over here. It is sad because there companies bring a different culture to the mix than any others. If you have never been in a Citroën with a pressurized hydraulic system (DS) you've missed something. (Oops, rambling again) I am surprised Renault have put up with the fiasco that has been the rules book over the last 8-10 years. I wouldn't be the least surprised if this is their last year and that they've been up front enough to warn Alonso so he can get the best deal possible, which would lead to the latest headlines of him going to Ferrari. Guilherme: It does seem that Ghosn, the CEO of Renault, does not care one way or the other about F1. But the company has stuck with the team through the latest political problems and says it is ready to sign a guarantee of participation to 2012 in the Concorde Agreement. Somehow I still doubt their commitment however. The Tru7h: Quite right - duly fixed. Nick: Don't get me started on Citroens - I love 'em! The best cars I've ever owned have all been Citroens. Let's remember that Honda was commited to compete in 2008. So it will be no surprise if Renault leaves before 2012, although I've never said they would do so. However they do seem to make their F1 cars and engines a little more reliable and I too would be sad to see them leave F1. Would it be fair to say that the Williams/Renault partnership gave us some of the best Racing in the modern era? Lee:The average Renault is pretty much that, until it gets old, then it's pure hell to work on. But.. the interesting ones, the Alpines, Gordinis and Turbo 5s were all great and were close or equal to the competitions offerings. I learned how to put whole sentences of French profanity together working on cheap Renaults. The R-8 was amazing. The gas filler was under the engine hood, right beside the bloody hot engine. I agree with Pink Peril though. Fiats were worse. Changing front disks on a 124 needed a half hour and a 12 lb. sledge. Lee and Peril: Is that not the attraction of French cars, especially Citroens? They are so different and quirky that one becomes attached to them in spite of their faults. I started driving in the sixties in a Renault Dauphine and have loved rear-engined cars ever since. And I am a Citroen man through and through - the AXs and ZXs I owned years ago made sure of that!